This category features any costumes made by viewers, authors, or Poptropica itself. Our new spooky (spoopy?) header! I might just have to do a Gender Glitch for this one because both of these costumes look really cool. Of course, it’s limited time, so get it as soon as possible! It’s 400 credits for non-members, and, as always, free for members. If you’re low on credits, you can always spin the new…Halloween Spinning Wheel! Yep, it’s fully Halloweenified with fall colors, cobwebs, spooky spiders, and jack-o-lanterns. Also, the Poptropica Help Blog is having its annual Halloween contest! If you dress up in a Halloween costume or fall-related costume and win, the Creators are giving a 1-month membership to all the winners! Anyway, the winner’s of the Creators’ Photo Booth Contest are here! Golden Typhoon didn’t just make a great werewolf costume — she also posed it mid-transformation for a dramatic photo. Look how the other wolves are welcoming the newest member of their pack! Creepy! Judging by the entries we received in this category, Poptropicans know how to get down! Please invite us to all of your future parties. Our winner was Speedy Knuckle, whose composition and character poses made for a rockin’ good time. Tons of hilarious entries in this category. In the end, we had to give the top spot to Tall Kid, who gave us three monsters (and two bats) chasing a poor Poptropican in a hot dog costume. We always knew that would get you in the end. Every photo we got was creative. Smart Glove zoomed out to show Halloween from a perspective we hadn’t really seen before. The Jersey Devil found his way into a lot of the scariest photos, but it was Maroon Bird’s contribution to the Slenderman tale that earned top honors in this category. So what did you guys dress up as this year? Share your Halloween stories below! Hey guys! We are a bit behind, but I will try my best to share major updates. There have been a ton of new Mystery of the Map pages, so be sure to check out the Poptropica Creators’ Blog to catch up on the story. There have been 31 pages already! The Creators’ Inside Poptropica Playlist has also been updated. The new videos include remarkable realm tours, a zombie dance, and more. Moving on, PopStorm 16 and 17 have been released. 16 is a Poptropican styled bug battle and 17 shows some girls with curls. Hmm… what else is there…? Oh yes! If you haven’t heard of this dressgate thing, you probably have disconnected from the world for a while. Thankfully the hype of this black and blue/white and gold dress has gone down. If you went onto Poptropica during all the chaos, you may have got a few cool costumes. 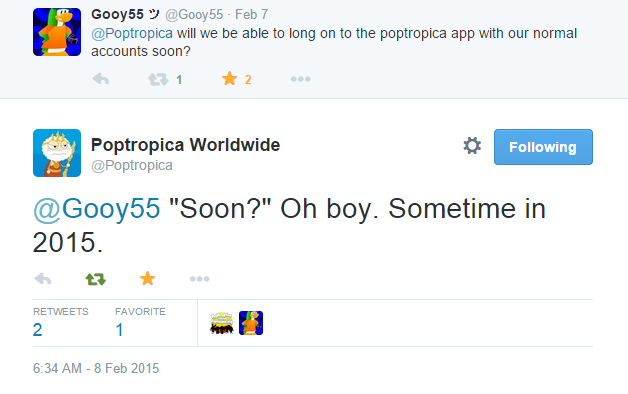 Of course the dress isn’t the only thing Poptropicans are fangirling over. The Creators recently released a few sneak peeks for the last Arabian Knights episode… specifically images of a very sad looking princess. Many theories have already been popping up. So what do you think the island’s future will hold?